Many organizations have turned to large-scale data gathering and analytics to differentiate their business and compete on a higher level. While it may seem like everyone is doing “big data”, not all organizations have approached the initiative with a strategy that will ultimately succeed. 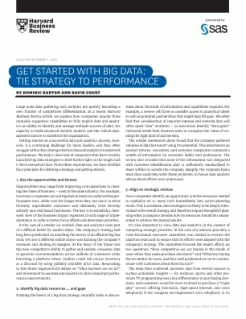 This Harvard Business Review paper explores the very real and difficult challenges that C-level executives face in setting a sound strategy around data and analytics and provides four principles that your organization can put in place to guide a successful big data initiative.